Deployment of web sites is usually done by copying the compiled ASP.NET web site files into the target virtual directory using Copy Web Site or Publish web site features in Visual Studio and manually creating and configuring the Web Site in IIS. Though this method is simple, it involves lot of manual effort in verifying the Pre Requisites, Creating/Modifying or Configuring the Web sites in IIS. We can automate this whole process by building a simple Windows Installer Package using WIX. Let’s create a simple website and add a Web Deployment Project to it. We will build the installer package to deploy this web site on to the target server. Right click on Web Deployment project and open the Property pages to set up the output location for our compiled web site files. Leave the default values for this demo which is set to the project output folder. This location we will be the source for our installer package to pick up the required files while building the installer package. Install the WIX 3.0 Visual Studio plug in from http://sourceforge.net/projects/wix/files/. And for basic understanding on the Directory, Component, Feature and other elements in WIX source files use the WIX documentation file in the installed location of the plug in or go to http://www.tramontana.co.hu/wix/. Once the plug in is installed add the new WIX project to our sample web site solution by going to add new project –> Select WIX. The Product.wxs is the WIX Source File which we will modify shortly to define our package components. Before that add references to WixIISExtension.dll and WixUtilExtension.dll in WIX binaries location to our WIX Project. Now open the Product.wxs and add the following xml namespaces to get the intelliscenece for WIX IIS and other elements. The default directory structure defined in Product.wxs maps to “C:Program FilesApplicationName” which specifies the target install location for our package i.e. the location on target server which will have all the output files from our MyWebSite_deploy project (See Fig 3). The component MySite_root_Files defines all the files that are directly needs to be copied under the INSTALLLOCATION. The <File/> element specifies the actual file that needs to be copied and the source attribute specifies the complete source path of the file. Along with the files Default.aspx and Web.Config we also have bin folder in project output directory which needs to be created under the install location. So create the folder mapping INSTALLLOCATIONbin by adding the directory element under the INSTALLLOCATION directory. And define the component and file or Directory element for each of the files and directories under the bin folder as we have done for INSTALLLOCATION directory. The same way we can add any number of directories and files mapping from source to the target location. So far we have seen how to move files from source to the target location by using the Directory, File and Component elements. But how can we configure IIS? WIX has an API or an Extension (WIXIISExtension.dll) to interact with IIS. Remember that we have already added reference to this to our WIX Project. 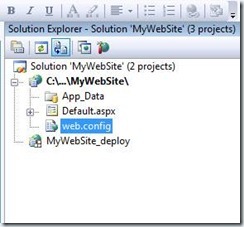 Add another component under the INSTALLLOCATION directory to define the configuration to create a web site in IIS. <iis:WebApplication Id="MY_WebApp" Name="MY Web Site" WebAppPool="MyWebSite_AppPool"
Most of the elements and their attributes in this component are self descriptive. <Util:User/> define the domain user which can be referenced anywhere in the source file using the Id MyWebSite_AppPoolUser. <iis:WebSite/> and its child elements <iis:WebAddress/>, <iis:WebApplication/> and <iis:WebDirProperties/> define the complete web site in IIS. The Directory attribute of Web Site element is set to INSTALLLOCATION i.e. C:Program FilesMyWebSite which is our target location to copy the compiled ASP.NET files to run our Web Site. The bindings IP, PORT and Host Header for our web site are specified by <iis:WebAddress/> element, and the mapping between the application pool MyWebSite_AppPool and the site is defined by <iis:WebApplication/> . The Default Dcoument and the Authentication are specified by <iis:WebDirProperties/>. So we have defined all the components (MySite_root_Files, MySite_bin_Directory, and MyWebSite_IISConfigure) that need to be installed on to the target server by our installer. But we know that every installer needs at least one feature which is a set of components that define one complete install feature i.e. our Web Site in this case. We have to define it using the feature element. That is it. We have completed authoring the installer package for our Web Site. Upon building the entire solution again our Set up project reads the compiled ASP.NET files from our Web Deployment Project out put folder and embeds them into a Windows Installer package which is created in the out put directory of our setup project. We just need to copy this installer package to the target server and double click and wait for the job to be done. Once the install is complete, open the IIS Manager to see that our web site running. The web deployment using WIX is simple, flexible, and gives a overall great web deployment experience. Thanks for visiting and commenting. Glad to hear that it helped. You are the first commentor on my blog. Could you share your website definition WIX code?. I have done an uninstall and it did not touch my Default Web Site. 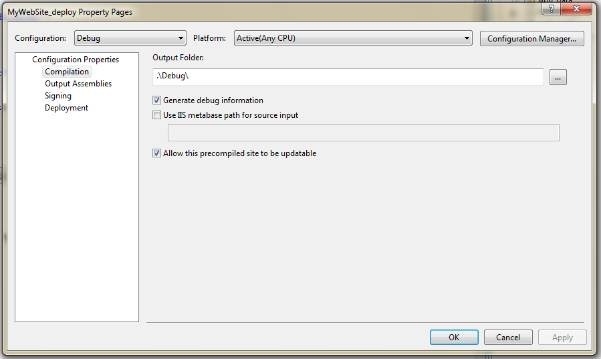 How do you configure the installer to run db scripts and create patches to the application. Wix has SQL Extension which can be used to work with SQL Scripts. I will do a post on it sometime later. Contact me offline if you need immediate help. Thanks, I looked into it. There’s one more question how do I automate the process of adding files under the component MySite_root_Files. I have more than 1000 files / images etc. Is there a VS plugin that will automatically traverse thru the folder structure and add the entries. There is a tool called Heat which comes with Wix installetion which will author the Wix file from Directories or IIS Web Sites. But I havent had a success with that tool. So I wrote my own console application in C# to do it. But you can give a try to Heat. can something like this be used on a website that gets deployed to a server farm? Thanks for visiting. The Generated Setup File can be deployed on to any server with IIS installed on it. Please let me know if it does not answer you. Can you share the code. I tried Heat before without any luck. Is it advisable to have just one component for all content files or each file becomes a component. Hi Ranjith, first of all thanks for this post.. I just tried the steps that you have mentioned but the when i building the entire solution at the last stagegetting the error saying “Illegal characters in path”. Please help me on this. if I create a virtual directory under the existing site other than the default website, it is creating , but with apppool as default apppool not the application pool of the website , can you please tell me what is the reason? It is very urgent issue for me. is there any problem with WIX 3.5 ? Hi Ranjith, thanks for this.. i just need a sample solution which so that i can see how the configuration made. Could you provide me some guidance to do updates to a .json file instead of a configuration file like web or application config. Sir i am a student. please guide me. this is the task assigned to me in term project. Sir i have added asp.net simple web application then i right click on this web application and i don’t find web development project. 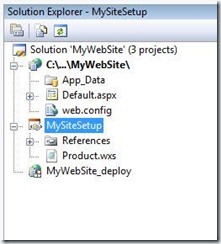 my question is how to add web development project which name in your example is (MyWebsite_deploy) where to find this? I want help in automatic detection of sql server instance name. so that it will automatically change connection string in web.config file. My wix code is working properly but only thing I want is SQL Server instance name so that I do not have to manually change it in web.config after deploy. It would be great help if you could share the entire setup project. Leave a reply on "Automating Web Deployment using Windows Installer XML (WIX)"